There are very few buildings that can take your breath away in the way the Pantheon in Rome does. This is the one and only building in the eternal city that has remained nearly intact and unchanged over the course of the last two millennia. Built in 125 AD, the Pantheon has not simply survived 18 centuries but has also preserved many of its original features. The Pantheon is one of the best preserved ancient Roman buildings in the world, an exceptional architectural achievement and marvel that a visitor to Rome should not miss. On entering the Pantheon, one passes through a portico supported by 16 colossal marble columns. The sheer size of the columns makes one wonder how the ancient Romans managed to ship them all the way from Egypt to the eternal city. The huge bronze doors that open into the Pantheon are the originals created 18 centuries ago. Once these doors were gilded just like the portico, while the roof that was covered in gold tiles but all those precious decorations of the building were either looted or used by the popes in the construction of other architectural marvels. At 43 metres high and 43 metres wide the Pantheon is a perfect sphere. 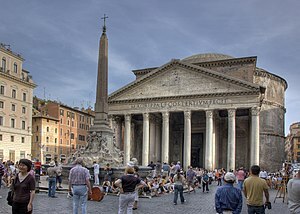 Until the 15th century its dome was the largest in the world, and until the end of the 19th century the Pantheon itself was the largest concrete building ever created. A giant opening in the roof called oculus lets light into the monumental interior. When rain falls through the oculus, it leaves the building via a drainage system. Inside the Pantheon a visitor is surrounded by an oasis of calm and peace. Look up and you will feel small surrounded by the towering walls and the massive dome. The shaft of light pouring down through the oculus creates an unearthly sensation of being in a sacred place. The magic is complete if you happen to witness raindrops or snowflakes slowly drifting down through the oculus. As the name reveals (pan - all and theon - gods), the building was created as a temple to all Roman deities. The religious ceremonies held inside involved the sacrifice and burning of animals. The oculus served a double function as a source of light and a chimney through which smoke from the rituals escaped. The niches between the columns held the statues of pagan deities that the ancients worshipped. When Christianity took over the pagan beliefs, in the 7th century the Pantheon was consecrated and converted into a church by the pope. Owing to this the building survived looting and destruction while many other pagan temples were completely erased. The church was dedicated to the Virgin Mary and all saints and an altar was placed opposite the entrance with an icon of the Madonna above it that can still be seen today. Once occupied by the statues of Roman gods, today the niches in the walls hold the tombs of the artist Raphael and several Italian kings. The Pantheon is situated on the Piaza della Rotonda, a lively square bustling with tourists. One of Rome’s magnificent obelisks towers right in front of the Pantheon, while an 18th century fountain adds to the ensemble of architectural splendour. Restaurants abound in the piazza, and although prices are high here, the views are well worth the money. The Pantheon is open daily from early morning till early evening, except for a few major holidays. Religious services, concerts, literary readings and even weddings are held inside. Entry is completely free of charge to all visitors. To avoid the crowds of tourists, visit early in the morning when the Pantheon has just opened its doors and enjoy the serenity and splendour that reign inside this ancient temple. Check out some of the walking and sightseeing tours available on the website for inspiration.